If you are a foreign person who has sold Australian properties or thinking of selling, you will need to take into consideration the Capital Gains Tax (CGT) to be paid to the Australian Taxation Office. 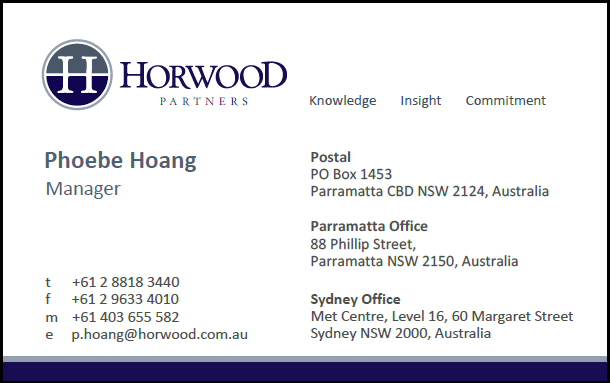 Horwood Partners will be able to assist you in preparing and lodging your income tax return with the Australian Taxation Office. This calculator is intended to be used by non-residents to estimate the amount of Capital Gains Tax (CGT) and tax payable. Please note that this calculation is an estimate only, and you will need to contact us to determine precise numbers. Your business advisor is Ms Phoebe Hoang. Please feel free to contact Phoebe if you have any queries.